Reading with your child is one of the most important factors in developing lifelong learners and lovers of reading. There is a vital link to between reading ability and the success of students. The example you set, the priority you place on the importance of reading, and the bond you create lasts a lifetime. And science proves reading to your child changes their brain. Consider these tips for helping your child become a successful reader. Read at least three stories aloud every day from birth—a favourite, a familiar and a first-read. Plan for occasions when your child might become bored, anxious, irritable, tired or disruptive and have a book in your bag. Pull the curtains on the day with a regular bedtime story so your child goes to sleep knowing they are loved and safe. Share stories that you enjoy reading because children are very adept at detecting reluctance and boredom. Choose picture books with well written stories, rich vocabulary and appealing pictures. Look for rhythm, rhyme and repetition. Focus your child’s thoughts on what the story will be about by discussing the cover and the pictures and thinking about what might happen. Encourage your child to join in the rhyme, the rhythm and the repetition. Talk about the story and what happened in it. Ask them what they think will happen next. Read it again and again and again if they ask for it. Look for other books by the same author if your child really enjoyed the story. Join your local library – there are riches galore! Read your own books in front of your child so they see that you enjoy reading too and value it as a worthwhile activity. Treasure this special time with your child—it will pass very quickly. Read to your child from birth. Talk —Help them build a wide and varied vocabulary, hear the rhymes and rhythms of the language and confidence with a range of sentence structures. Listen – The skills they use putting together ideas, constructing sentences and ordering their thoughts are also critical in reading. Praise – Acknowledge what they can do rather than picking on what they can’t. Children need encouragement because they are doing the best they can. Buy books – It shows you value reading. Choose books that will appeal to your individual children and take them with you when you do. Let them choose with you, or allow them to choose books from the school book clubs. Give books as presents to your child and others. It reinforces that books and reading are valuable and valued. Read – When your children see you enjoying reading, they follow your example. Visit your local library regularly – It’s free. Enrol your children and make a visit a regular routine. Cook Read the recipe together and share the results. Read the TV guide – Discuss the options, and plan your viewing. Play a game – Whether it’s a board game or digital, there are instructions to read and understand as you play. Go shopping – Read the road signs, notices the labels on packets. Give them a list of things to look for. Write letters and emails – Write thank you letters or party invitations together. Encourage them to write to Gran and Grandad, Father Christmas or friends who have moved. Make something – Figure out the instructions together. Discuss their meaning and sequence. Draw and write – Ask your child about their drawing and print the caption. They can copy it if they wish and read it back to you. 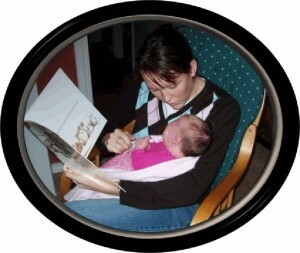 Do-it-yourself – Make print or digital books together using photos of family events. Write the sentence that your child dictates. Experiment – Let them play with digital publishing apps. Max’s Toolbox is perfect for this. Subscribe to newsletters that will keep you abreast of what’s new. Talk to your school’s teacher librarian – they are reading experts and even if your child is not at their school yet, you might be able to borrow from their collection. Listen to what other parents are sharing with their children for ideas of what to share with yours. illustrations that help make the meaning of the text clear. At the beginning of Elmer we learn that “Elmer was patchwork. Elmer was yellow and orange and red…” and the illustration clearly shows that patchwork is a pattern based on squares, not swirls or dots or whatever. Read children’s books so you know what will work for your child when. Reading with Your Child by Barbara Braxton is licensed under a Creative Commons Attribution-NonCommercial-ShareAlike 4.0 International License. Based on a work at http://thebottomshelf.edublogs.org/reading-with-your-child/. Hello Barbara. You never cease to amaze me! Your Blogs are very good and I was wondering about how to get your Blog out there to the parent community. I was thinking about posting it on FB or as a Pinterest page. What do you think? Parents these days are so techno savvy so I am trying to think about the best way to get the message to them. I guess the best way is to share the URL through your social networking tools or newsletters. People can just click on it and they will find it. I don’t have time to maintain separate FB accounts for each blog but there’s no issue with you writing about the blog and sharing the URL on yours or the school’s FB page. Whatever it takes to get the message out there, i guess.